The best way to learn about your local creeks, watersheds, and rivers is to go there and walk, bike, throw stones, kayak, etc., but, in case you’re looking for something to read on the bus on the way there, I offer some recommended reading. I will recommend other electronic reading and other books and publications again soon. This is one of the best books that I’ve read all year! It’s filled with lots of clear illustrations and step by step details on how to retool your landscape to catch and infiltrate rainwater. It features lots of real life examples, too. It’s a bit wonky, hence probably not for everyone. For us to remove concrete from our local waterways, we’re going to need to heal our watersheds. Brad Lancaster talks about treating rain as a welcome guest – invite it to slow down and stick around a for a bit. If we can allow rainwater to slow down and soak in, then we solve lots of problems for our waterways – water quantity (flooding), water quality (pollutants break down in the earth), water supply (increased infiltration means more groundwater available locally to drink), and greening our neighborhoods. Excerpt: [A] well-designed and built [rainwater havesting earthwork] system can operate as a “beneficial ruin” once established since it can be largely self-maintaining. Long-abandoned earthworks located throughout the world still function and help support pocket oases of vegetation. Examples in the Southwest U.S. include check dams, terraces, contour berms, and stone mulches constructed by prehistoric Native Americans and more recently by the 1930’s Civil Conservation Corps projects. Each time I come across one of these old earthworks, I find a lost world full of life. This is another of my latest favorites. It’s a great narrative about an intrepid band of very human river activists in northern California who endeavor to preserve and restore salmon runs on the Mattole River. Excerpt: A race of salmon is an expression of the river, the intelligence of the terrestrial home traveled to far seas – always to return to its place of birth. Salmon return to their riverine homes with the wealth of the great sea embodied in nutrients they will deliver to the waters and plants and animals of the forest at the completion of their lives. Migration is an adaptation toward abundance: more fish are born than the river can support; thus out-migration to the pastures of the sea. In the case of salmonids, migration and return is a dynamic ritual binding population to place. A perennial favorite (and I am happy to be mentioned in the foreword to the paperback edition.) This well-written and very readable book is full of maps and historic photographs. It shows the histories of flooding, water supply, agriculture, and current efforts to restore. I learned a lot about the history of Los Angeles from this book. Love that description of the Arroyo Seco and the LA River! Thanks for reminding me. I heartily second Joe’s last two recommendations (having not read the first…). And I credit Blake Gumprecht for sending me off in the right direction for locating documentary sources about LA’s rivers and streams, not only through his book but advice kindly given via email. 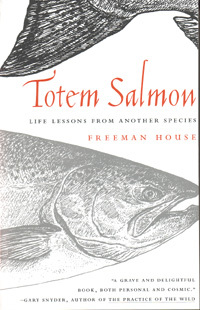 Totem Salmon was amazing for his vivid account of life with salmon, and what it means to live with nature, and life & its struggles. You are currently reading Some Summer Reading Picks at L.A. Creek Freak.